Don passed away peacefully Saturday May 28th. 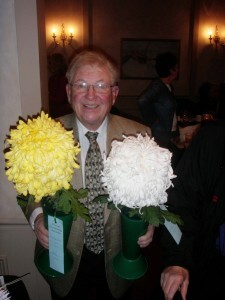 His skill, artistry, and knowledge of growing Mums will be missed as well as his great sense of humor. Golf courses and ski slopes will not be quite the same without Don. MEETING OF THE ECA – THURSDAY June 9th, 2016 at 7 PM at the Seattle Police Athletic Association Office (SPAA) site; 11030 East Marginal Way South, Tukwila. June is a particularly busy month in growing mums so hope you can attend the meeting and bring your questions! A big thank you to Mark Ross for again doing the yearbook. It is a doing big project! The digital yearbook will be sent out, likely prior to the meeting. – Ronnie Elliot may still have 4 to 6 foot bamboo stakes available for 10 cents each – call him or Gary B to order. You’ll need some or most of the above when you move on to the final 9″ pots. The M&R Mix and pumice are part of the standard 9″ mix along with some Cedar Grove or other brand of compost. Note the Cedar Grove compost is available at McClendon’s Hardware and many garden stores. It contains no Manure. Some other brands of compost do contain significant amounts of manure. A small quantity of moist manure is recommended to provide microbe action in the otherwise dry mixes. If you have manure already in your chosen compost, you may choose not to add more. I Generally throw in a med. shovel of manure with every bag of Cedar Grove.